Surround your window sample in the timeless beauty of real oak. Alpack offers a sturdy, attractive floor display handcrafted from solid red oak. Set it directly on the floor or attach the optional swivel base. Whether in a showroom, shopping mall or home show, eye-level floor displays attract customers. 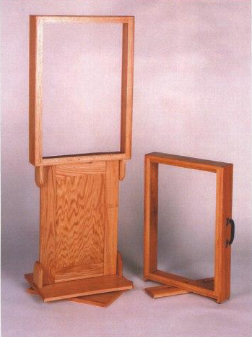 For in-home demos, Alpack features durable, handsome oak frame sample cases. Our oak cases feature a swivel foot for stable demonstration of all window styles. Can be used for table top or floor level demos. Let the beauty of natural oak work for you. Alpack oak cases are available in standard as well as custom sizes, all at reasonable prices. Please call or fax for details.